Tron: Legacy is a 2010 American science fiction film produced by Walt Disney Pictures, released on December 16, 2010 in Australia and December 17, 2010 in North America and Europe. It is a sequel to the 1982 film Tron. Joseph Kosinski makes his feature film directorial debut with Tron: Legacy, while the previous film's director, Steven Lisberger, returns as a producer. 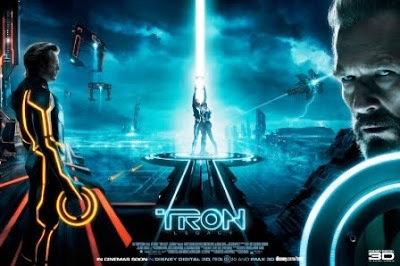 Jeff Bridges reprises his roles as Kevin Flynn and Clu, while Bruce Boxleitner reprises his roles as Alan Bradley and Tron. Garrett Hedlund portrays Flynn's adult son, Sam. The other cast members include Olivia Wilde, Beau Garrett, Michael Sheen, and Daft Punk. The film's soundtrack was composed by the electronic music duo Daft Punk. In 1989, Kevin Flynn (Jeff Bridges), an innovative software engineer and the CEO of ENCOM International, disappears. Fifteen years later, his son, Sam (Garrett Hedlund), who became the controlling shareholder after his father's disappearance, takes little interest in the company besides an annual practical joke on the board of directors. Sam is visited by his father's friend and ENCOM executive Alan Bradley (Bruce Boxleitner), who urges Sam to investigate a mysterious pager message originating from Flynn's old arcade. While exploring the arcade, Sam discovers a concealed computer laboratory and unintentionally transports himself to The Grid, a virtual world inside the computer. Sam is captured and taken to the game arena. He is eventually pitted against Rinzler, the champion of the games, who notices that Sam is not a program, but a User. Rinzler takes him before Clu, a digital copy of Sam's father who rules The Grid. Clu nearly kills Sam in a Light Cycle match before Quorra (Olivia Wilde) rescues him. Taken to a distant hideout in the "Outlands," Sam is reunited with his father, who reveals that Clu betrayed him and defeated Tron, seizing control of The Grid and forcing Flynn to remain in hiding. Clu also committed genocide against sentient "isomorphic algorithms" (ISOs), self-produced programs that carried the potential to unlock mysteries in science, religion, and medicine, because Clu considered these ISOs to be an imperfection. When the portal closed, Flynn became a captive inside his own creation until Sam re-opened it from the outside. Resolving to make it back to the real world where he would be able to delete Clu, Sam makes his way back to The Grid to find a program named Zuse, who he believes can provide safe passage to the portal. The End of Line Club owner—Castor (Michael Sheen)—is revealed to be Zuse and betrays Sam to Clu's guards. Though Flynn and Quorra arrive just in time to help Sam escape, Quorra is wounded in the process and Zuse gains possession of Flynn's identity disc. Knowing the disc works as a master key to The Grid, Zuse attempts to negotiate with Clu, but Clu simply takes it and destroys the club. Stowing away on a transport ship, Flynn heals Quorra, who is revealed to be the last surviving ISO. The three unexpectedly arrive at a station aboard a massive warship. When Quorra allows Rinzler to capture her to serve as a distraction, Flynn recognizes Rinzler as a reprogrammed Tron. Clu addresses an army of troops, expressing his desire to enter the real world and reform it to his ideal of perfection. Sam saves Quorra and reclaims Flynn's disc. The trio then commandeer an aerial shuttle and are pursued by Clu, his guards and Rinzler using Light Jets. Between Quorra's evasive flying and Sam manning the rear turret, they manage to shoot down Clu's guards. During the conflict, Flynn and Rinzler make eye contact and Rinzler regains his true identity as Tron. Tron declares: "I fight for the users", and he deliberately collides with Clu's Light Jet, causing both of their vehicles to de-res. As they are falling, Clu wrestles away Tron's spare baton and creates another light jet to continue his journey to the portal. Tron falls into the Sea of Simulation, where the orange illumination on his armor reverts back to his original blue. Sam, Flynn and Quorra reach the portal only to find Clu blocking their path. Flynn sacrifices himself to end the impasse, re-integrating with Clu to ensure Sam and Quorra escape. The two merge and explode just as Sam and Quorra use Flynn's disc to transport themselves through the portal to the real world. Back in the basement of Flynn's Arcade, Sam saves a backup of The Grid onto his flash drive. He then meets Alan and tells him that he will start working at ENCOM, and, as the controlling interest shareholder, he will name Alan chairman of the board. Sam leaves with Quorra on his motorcycle, showing her the sunrise she has longed to see. "Use a TOYin3D to watch this video in PARALLEL-VIEW on your mobile"